This throwback to the space program’s past highlights the power of dreams. In the new filmBilly Bob Thornton stars as Charles Farmer, an astronaut forced to leave the corps to save his family’s ranch. Thornton’s character can’t give up his dream of space travel, however, and the film follows his efforts to build a rocket in his barn that he hopes will carry him finally into orbit. Air & Space Editor Linda Shiner recently spoke with Thornton and the film’s writers, Mark and Michael Polish, about magic, astronauts, and rockets real and imaginary. A&S: The technology in the film appears to be Mercury-era technology. You were probably in grade school when John Glenn first rode a Mercury-Atlas into orbit. Thornton: I was. He was the first person other than an athlete that we as kids could look up to. John Glenn was easy to have as a hero. He was like Davy Crockett. A&S: When you play a character like Charles Farmer do you have to understand his dream? Do you have to try to understand the romance of space travel? Thornton: It’s like any role. You use whatever your personal experience is, for the most part, like having had a dream of being an athlete as a kid. And then coming to California and making my own movie was a dream. Sling Blade [his breakthrough film] is kinda my rocket, I guess. A&S: You’ve said you wanted to do this movie because it reminded you of some you’d seen as a kid. What about it made you feel that way? Thornton: It’s like some of those 1940s Frank Capra movies, like Mr. Smith Goes to Washington. It’s uplifting and makes you feel good. But the thing about those movies from the ‘40s, they weren’t earnest all the time. There was some humor in them, and the Polish brothers [who co-wrote, produced, and directed the film] have a quirky sense of humor. A&S: A dozen start-up companies are planning to build rocketships that will take civilians into space. Would you be interested in going into space for real? Thornton: I would love to do that. I don’t know for sure if I’d pass the physical anymore, but I’d like to try. A&S: Part of your character’s identity is that he was selected to be an astronaut. What qualities did you want to project to make people believe this guy could have been an astronaut? Thornton: One is a sort of magical quality. A guy who believes in magic and has wide eyes about the universe. But he also has to have a calm under extreme pressure. Even though he loses it a couple of times in the movie, he’s still single-minded and determined, no matter what’s going on in the world around him. A&S: How did you form that opinion of an astronaut? Thornton: It’s just what I assumed. I guess I got the characteristics of astronauts from the movies. And they all have a look, you know? Even if they don’t all look alike, there’s something about the way they carry themselves. Like Chuck Yeager. A&S: You looked pretty hot in that Mercury spacesuit. Any plans to add one to your wardrobe? Thornton: Oh, I don’t know about that. I might dress up as an astronaut for Halloween with my kids. I’ll tell ya, it was really hot in that suit. [The film was shot in New Mexico.] I didn’t have the benefit of the cooling system that the astronauts had. Before The Astronaut Farmer, Mark and Michael Polish made three feature films set in the American West: Northfork; Twin Falls, Idaho; and Jackpot. The brothers co-wrote their newest movie, Michael directed it, and Mark produced and acted in it. They also are the authors (with Jonathan Sheldon) of The Declaration of Independent Filmmaking: An Insider's Guide to Making Movies Outside of Hollywood. A&S: You mentioned at the preview that you’d consulted with Apollo astronaut Dave Scott on the film. What kinds of things did you learn from him? Mark: He said that we could never do a rocket launch with a family—that it would take 10,000 families. But we wanted to make sure we had the right kind of fuel to make the rocket launch sideways. So he advised us on the propellant, which was a mix of kerosene and hydrazine. 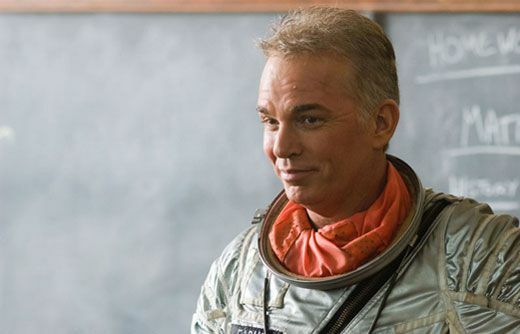 A&S: You returned to the Mercury era for the film: It was kind of cute to see Billy Bob Thornton walking around in a silver spacesuit. Michael: You know, we’re not from that generation [of people who grew up during the Mercury era], but it was fascinating for us to see that type of bravery in those men. We’ve watched movies and documentaries about them, and the kind of focus they had was amazing. Mark: There were a couple of other reasons; we had to have [hardware] that the character could get from salvage, and all of the material from that period has been declassified. And we thought if this character was deciding to build a rocket on his own, he’d probably go back to the original. A&S: The hero of your film, Charles Farmer, turns down a ride on the space shuttle. Why? Michael: Because it’s just that: It’s a ride. And at that point he has a do-it-yourself mentality. It was being sold to him as the alternative to something he wanted to do himself. If the film has a message, it’s “You can do it yourself with hard work and energy. Hard work ain’t gonna kill ya.” We weren’t trying to put a bad mark on NASA. We weren’t trying to say that what they do isn’t as good, or that a common man had a dream and NASA was standing in the way. It’s just storytelling. A common man was being kept from his dream, and NASA was just the device for that. A&S: When Bruce Willis’ character says “Civilians don’t go into space. Astronauts go into space. Professional astronauts who’ve been trained,” there’s a wonderful irony, because in fact many companies are getting ready in the next few years to launch civilians into space. Were you aware of those endeavors when you wrote the script? Michael: A lot of what Bruce Willis was about was to talk [Farmer] off that ledge, not to send a message that he can’t do it. He was saying Don’t do it. For me, that character was more about safety. He wasn’t trying to stop Farmer’s dream, he was trying to save his life. A&S: It’s a great scene; they must be friends in real life. Michael: They are. That scene was shot at about 3 in the morning, and we had to do the whole thing—from around the table in the kitchen to the scene in the barn—in about 12 hours. That’s how good they are. They were so good with each other. A&S: Could Charles Farmer have been any kind of dreamer? Or was the dream of space travel and a homebuilt rocket essential in the script? Mark: It could be both ways. The rocket allows him to be something extraordinary, so it’s more than just stepping in a ring for 12 rounds, which we’ve seen already. It could have been a dream of playing baseball or some sport, but building a rocket is such an extraordinary task. And the rocket can be a [symbol] for everybody. Everyone has a dream. Everybody’s got something they’re building in the garage. A&S: What was your inspiration for the idea of building a rocket in a barn? Michael: One day I walked into Mark’s room and said, “Wouldn’t it be a neat idea if a guy built a rocket in his barn?” It was that simple. I might have been watching space programs or something on the Discovery Channel. Mark: We’ve all been so removed from it—from doing things on your own. Our father kind of taught us hands-on, do-it-yourself things, like independent filmmaking. Every time we do a film, it’s like launching a rocket. You gotta get money, you gotta go round up the people, you gotta make everybody believe in you. A&S: Why did you choose Billy Bob Thornton for the role of Charles Farmer? Mark: It had to be somebody who was believable on a ranch like where we grew up in Montana, and somebody who could have been like John Glenn, only got dropped for some reason. The missing Apollo astronaut. A&S: Let’s talk about the rocket. It was supposed to be about the size of an Atlas. Mark: It was about 15 feet shy of the height of an Atlas. We buried some [of the length] in the engine room [in the film, a space under the barn floor]; otherwise we couldn’t make it work [as a rocket that could be built in a barn]. It fascinated me because I didn’t know anything about it. I went everywhere. I watched documentaries on the Apollo program. I went to the rocket graveyards sitting outside of Houston. A&S: The Mercury capsule looked authentic, but was the window a little bigger than on the original? Mark: We needed a tiny bit of help. It was slightly bigger; the capsule was built to specs, but we needed a little bit of light inside there. A&S: Would you agree that this is a heartwarming movie, but that it walks a line between the believable and the ridiculous? Michael: It’s nice to have a heartwarming movie in cynical times, and it’s okay to make a heartwarming movie. Mark: Anything worth doing is going to have some ridiculous quality. You tell people we’re going to the moon and they say What? That’s ridiculous. I watch documentaries on people who go to Everest, and they lose fingers and toes—and that seems ridiculous. To risk everything to climb a mountain? Movies were meant for the suspension of disbelief. You look at Jaws now and it looks really dorky. But it got people out of the water. They were willing to believe. We’re living in a time where everybody nitpicks and blogs about it. It seems to be taking away our optimism and the best of humanity. We live in a time in our country when there’s a need for a good shot of inspiration. A movie’s not going to do it all, but it will help you for an hour and half.